The Diphthongs FunBook focuses on the following: decoding words with diphthongs. (Examples of words with diphthongs: "soil," "round," "cook," "flew" and "jaw.") 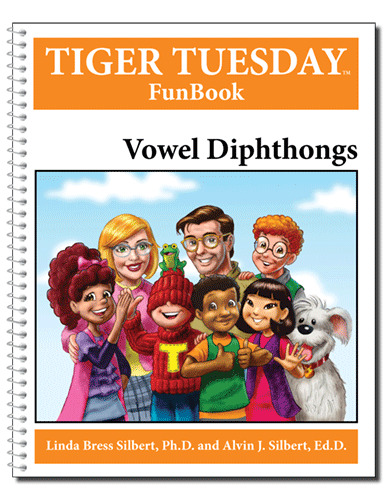 The FunBook keeps kids engaged using stories, activity sheets, games and plays involving a central group of characters—Tiger Tuesday, his family, and his pets. Because they are engaging and fun, the activities in the FunBook reduce anxiety and frustration often encountered in students struggling with reading while also enhancing self-esteem, social skills and higher-order learning. Each FunBook consists of 7 chapters. Each chapter begins with a Story. However, before the story is read, the child is introduced to new words with diphthongs, sight words and other special words and phrases that appear in the story. Each story is followed by Do You Remember to develop strategies for reading comprehension and Do You Know which integrates math, grammar, general knowledge, spelling rules, the ability to recognize and apply simple formulas, and higher order thinking skills. The next page, About You…, promotes identity development by stimulating thought about what a child might do (or do differently) in situations like those the Tuesday family encounters. With "story starters," students begin to formulate stories of their own, write them down, and illustrate them by drawing a picture. Next comes a unique type of Word Find, one which makes young readers focus on the new words encountered in the story and distinguish between words with diphthongs and those that don’t conform. Word Find is followed by activity sheets which focus on the primary decoding skill while continuing to focus on the story. Phonics Fun involves identifying the correct vowel. Clues are provided in both verbal and pictorial form. Rhyme Time reinforces familiarity with beginning consonant sounds. Word Jumble requires students to identify the correct order of letters in a word and demonstrate through writing. Name Game gives students practice in writing and spelling, going from picture to word. Circle and Write requires students to circle the words with diphthongs and write them on lines provided. Sentence Scramble exposes students to the basics of sentence construction. Focused on the main theme of the story, the words are "scrambled" and the student is required to write the sentence by putting the words in the correct order. The last pages of the FunBook consist of pages for the child to write their own stories and plays, and pages for the child to write contractions, compound words and monster words (irregular spelling words) they find in the story. The resulting lists can be used as reviews. The Student Form of the Tiger Tuesday Reading Inventory is included in the back of the FunBook as an ongoing measure of individual student progress.